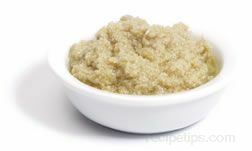 A popular condiment that has a savory flavor and is used to season a wide variety of dishes. 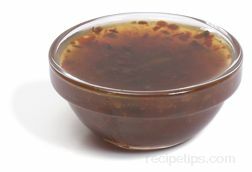 This thin dark sauce is made with soy sauce, garlic, onion, molasses, vinegar, anchovies, lime, and a variety of other seasonings. The name Worcestershire refers to the town of Worcester, England where the sauce was first produced commercially. A green colored herb sauce made from mint leaves, sugar, and vinegar. 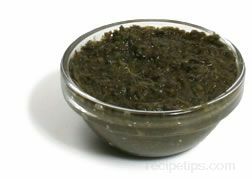 Mint sauce is often applied as a marinade to poultry, fish, or meat, most notably lamb. Mint sauce and mint jelly have long been traditional accompaniments for a variety of lamb dishes. Mint sauce can also be used as an ingredient for dips in which the sauce is combined with mayonnaise and yogurt, or it can be used as a means to enhance the flavors of potatoes and vegetables. There are numerous types of mint sauces that range in flavor from highly tangy to quite mild and mellow. Generally, the flavor of vinegar and spicy ingredients will be very noticeable in the tangy flavored mint sauces. 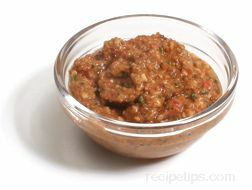 A popular Spanish sauce served most often with grilled meats, fish or vegetables. The traditional version of this sauce includes saffron, an emulsion of garlic and oil, eggs (to stabilize the sauce), mustard, olive oil, lemon juice, tomato paste, and seasonings. 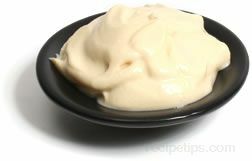 Today, it is more common to replace the emulsion sauce with mayonnaise. 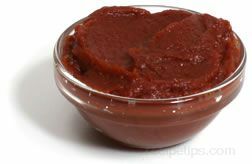 A sauce that is considered to be a traditional Catalan type of food sauce, which originated in the Catalonia region of Spain. Typically used as an ingredient to enhance the flavor of various foods, Romesco sauce is often served over grilled foods such as fish, poultry, meats, and vegetables. 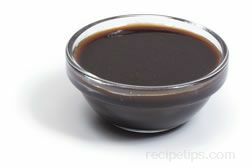 It may also be used as a flavoring for stews and pasta dishes, as well as a spread for breads with meats and cheese. 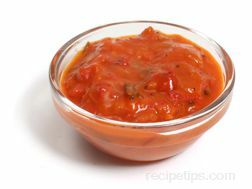 Considered by some to be a garlic sauce, Romesco is most often made with tomatoes, garlic, olive oil, blanched almonds, hazelnuts, vinegar, herbs, red chili peppers, and salt. Avgolemono refers to a traditional Greek soup or sauce. Most often, when it is made as a soup, bits of chicken are added to make it similar to a cream of chicken soup but one that has a lemony flavor. 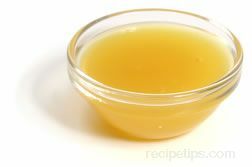 The liquid obtained from cooking fish or chicken is added to the soup along with eggs and the featured ingredient, lemon juice. 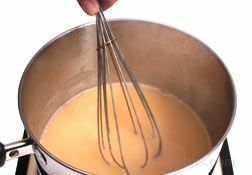 As a sauce for fish or poultry, the egg yolks and lemon juice are whisked separately from the egg whites, which are beaten into a stiff foam. The yolks and lemon juice are added to the stiff whites and the ingredients are then combined with the cooking liquid, which is reheated until fairly thick in consistency. When made as a soup, avgolemono usually includes a filler, such as rice. The soup is also somewhat thinner in consistency than the sauce. The sauce makes a very tasty lightly textured addition to meals of fish and fowl. This soup may also be referred to as Greek chicken soup or Greek egg lemon soup. A creamy Greek garlic sauce often served as a topping, a condiment, or a food dip, commonly served with a variety of Mediterranean dishes. Tzatziki is a white sauce made with yogurt, cream, cucumbers, fresh herbs, and seasonings, such as mint, dill, olive oil, and garlic. Served as a chilled sauce, tzatziki is commonly used on gyros, pita sandwiches, dolmades, roast lamb, roast pork or beef, fish or seafood, rice dishes, grilled vegetables, and many other foods. This cold sauce with its fresh ingredients adds a refreshing taste to many foods. 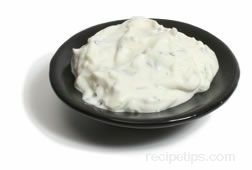 Tzatziki sauce may also be referred to as tsatziki, satziki, satsike, or simply as a yogurt and cucumber sauce. 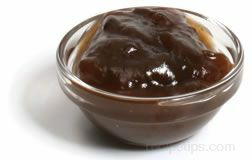 A sauce that may be made with wine or vinegar, dill, salt, garlic, possibly sour cream, mayonnaise, butter, and combinations of other ingredients. Depending on the consistency desired, dill sauce may be rich and creamy in appearance and texture, or mildly flavored with a light texture. 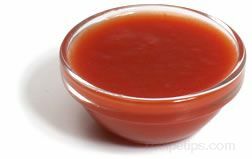 The creamy version is a sauce commonly used as a salad dressing or as a topping for meats and fish, such as grilled or roasted salmon. The lighter dill sauce is most often used as a marinade or cooking sauce for meat, seafood, fish, poultry, and vegetables, enhancing the flavor of the food. 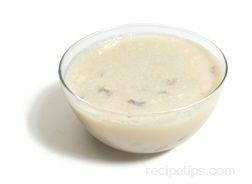 Korma is a cooking sauce that is common in India. Basically, it's a type of curry sauce with a mild flavor, seasoned with a variety of ingredients. Some of the ingredients that are most often used to make this sauce are onions, sugar, pureed tomatoes, coconut flour, coconut cream or yogurt, garlic, sunflower oil, lemon juice, citric acid, cilantro, nuts, and various spices. Korma Sauce is often cooked with chicken or lamb and then served over a bed of rice when preparing recipes known as Chicken Korma or Lamb Korma. Korma Sauce may also be referred to as qorma. A sauce made from artichoke hearts that is served over, or stuffed into, vegetables. 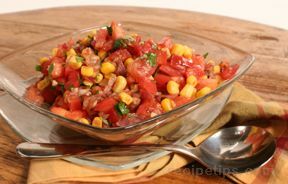 It is also added to pasta or rice or served as a condiment for a variety of foods and appetizers. 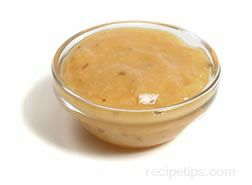 Typically the sauce combines the artichoke hearts with olive oil, vinegar, lemon juice, and other seasonings to create a rich and creamy sauce for pouring or spreading on foods. A common Ethiopian sauce that has a hot and spicy taste. Made with the seeds of cumin, cardamom, coriander, and fenugreek that are combined with garlic, ground cloves, turmeric, grated gingerroot, black pepper, salt, paprika, cinnamon, and dried red chilies, this sauce provides a distinctive tangy flavor for ethnic foods.